There are all sorts of things that get people excited and passionate – some good, and some not so good. It might be a new car, or the next sexual conquest, or making lots of money, or one’s favourite sports team, or going shopping, or checking out a bookstore (hey, I resemble that remark! ), and so on. The list is endless. Here I want to narrow things down a bit. I want to just speak about Christians, and I want to speak about something I have noticed in terms of what gets people passionate or keen in terms of what I write about on my website, and what I share on the social media. Over the years I have noticed that two main sorts of articles or emphases will often get two rather different sets of responses. But let me first mention who my primary audience tends to be. It seems that most people who look at CultureWatch and most people who follow me on the social media are Christians. While many non-Christians follow me on both, I would think that overwhelmingly my main readers are those who claim to be Christians. And it is interesting to see what seems to get them excited. This can be measured in various ways. As to my website, obviously how many people comment is one indication. And there is software available to monitor my web traffic, and determine which pieces are visited the most, and so on. As to things like FaceBook, the three most obvious ways to see if you are getting a lot of response is how often the post is shared, liked or commented on. That can give you a pretty good indication as to which issues folks seem most passionate about, or what really presses their buttons. So, back to the two major sorts of articles I tend to run with. One could break down these sorts of things into two broad camps: all things biblical, theological, doctrinal and devotional; and all things culture wars. Of course there is plenty of stuff that I do write about that may not readily fit into these two broad categories. The former grouping would contain all sorts of things on biblical studies, the importance of theology, Scriptural truths, and practical hortatory pieces urging us on to a greater love for Christ, deeper commitment, more obedience, more devotion and personal holiness, and so on. They are Christian articles mainly meant for other Christians. Pretty important stuff I would have thought. And stuff that all Christians should relate to, be challenged by, and want to promote to some extent. The other major grouping of course covers all the main battles we face today, whether the issue is abortion, Islam, homosexuality, cultural Marxism, the trans agenda, the battle over marriage and family, and so on. Often non-Christians can just as much benefit from, and be passionate about, these pieces as Christians can. These topics I also obviously think are very important. But the interesting thing is this, when I write articles from the first main group, and share them on my site and on the social media, the reaction is generally quite subdued, sometimes quite underwhelming. Some comments and discussion – or debate – will come in to my site, and some likes, shares and comments will appear on the social media where I have also posted these pieces. But for the most part the response is not exactly overwhelming. Certainly on mainstream Christian topics, doctrines and devotional pieces, the reaction is somewhat limited. Mind you, I have discovered that Christian and theological topics that are basically secondary in nature, and are minor, not major, will often get a lot of heated responses. Dare to write on any number of these topics and often all hell will break loose, and Christians you never heard from all of a sudden come out of the woodwork with very impassioned positions on the matters. -Should there be women leaders? (in church and at home)? -Should Christians support the death penalty? -Are the charismatic gifts for today? -Is the rapture theory biblical? -Is the premillennial view the only one a believer can hold to? -Is the KJV the only Bible we should use? So that in itself I find a bit interesting: major biblical beliefs and core doctrines that I write about usually get limited attention and response, but various minor matters that we should take a bit loosely will often get all sorts of Christians quite passionate and vocal about. But let me go back to the way these two main categories are responded to. Examples of this can easily be found on my own site. As one case in point, a while back I wrote six articles in a row on Bible study helps for some of the Old Testament books. During the next three days the six articles were shared 92 times altogether on FB. I suppose that is not bad. However, an article I posted around the same time on the Islamification of Sweden mustered some 800 FB shares in just a day or two! Again, not bad I suppose, and I of course am grateful that they have gotten some sort of response. But contrast this to the response to the library drag queen article: it has already been shared over 1,400 times – although it has only been up for less than 24 hours! Now with these two examples – and I could offer more like them – we see how Christians tend to respond to what I write about. While I think both main sets of topics – the biblical/theological, and the culture wars – are very important indeed, the latter seems to be of far more interest than the former to most believers – at least the ones who read my stuff! Now there might be various reasons – perhaps some better than others – as to why the theological and devotional articles and posts get far less interest and attention than the ones on the culture wars do. Perhaps some of you might write in here and tell me your thoughts on this. I discuss all this not as a complaint or to criticise anyone. I just find it all a bit curious. I would have thought that passionate Christians would get just as passionate about biblical and devotional writings as they would about writings on the culture wars. But the numbers seem to suggest otherwise. Again, this is not something I am upset about or complaining about. I just find it to be interesting that the one type of article will normally get much more interest and response than the other. Just something to think about I guess. And it should be pointed out that it would be easy for me to go with the flow here: since most folks seem to prefer articles on the culture wars, maybe I should just give them that, and ease up on the biblical and devotional stuff. But I feel God is calling me to do both, and in some ways, I feel the latter pieces are more important. They may not get as much interest, but as I think and pray about this I am reminded that if even a handful of people become Christians, or are discipled, or are encouraged along the way, it is well worth doing these articles. Sure, they may never appeal to the Christian masses, but that does not matter. What matters is doing what God wants us to do. I certainly do want Christians to become aware of and get involved in the culture wars. That is so very important. But perhaps even more important is for all followers of Christ to become more like him and represent him better. So I will keep writing the devotional and theological pieces as well, even if it seems that they are not having such a wide-spread response or impact. Of interest, six of them are on religious and biblical matters, and six of them are on the culture wars. Interesting. 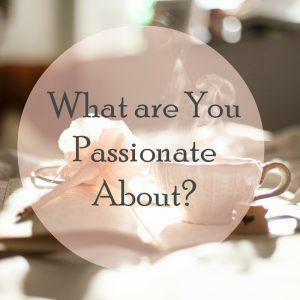 21 Responses to What Gets You Passionate? There are many places one can go to for Biblical and theological resources and commentary, not so many places that provide a Christian comment on current affairs. So based purely on what’s available, this site becomes a go to place for the latter, less so for the former. Thanks Warren. I had not thought about it in those terms. Could well be. I appreciate both avenues of your posts. I tend to agree with Warren. We need places like your page to keep up to date with what is happening in the world around us, and how we as Christians should/can respond. Keep up the good work! Why write about what is basically settled? It’s far more interesting to engage on areas that are a bit vague or confusing – and more helpful. Also the current issues will always be more interesting because they are far more relevant. Thanks Nathan. Although as those who relish theology all too well understand, what is supposed to be settled hardly ever is, with constant challenges to the old orthodoxies! I definitely like both types of your articles. But I am sort of drawn to the articles that are on culture wars. The reason is that there are not many who know how to write about in Christian perspective: in depth and so informative! So grateful that you do this amazing job!!!! I greatly appreciate the biblical commentary and articles, I share them less often than cultural related pieces because similarly to what you’ve noticed, I get less response to them, I think because they are generally more biblical “meat” than “fluff” whereas the cultural related articles appeal to a bit broader range of Christians and some non Christians. I would say I have gained a huge insight into current day cultural wars through a biblical lens due to your depth and breadth of knowledge in your articles Bill. I try and read all your articles when time permits, I just attend two bible studies a week and getting things ready for them tends to be enough for me with work and my other commitments etc, so I just can’t take in the articles you write on other topics as I’m just not learned in them, it is relevant to me if I’m doing the bible study or have done it but I don’t have time to soak it in otherwise as my times limited, but having said that when I’m looking for a resource or insight into a biblical topic culture watch and the got questions site is the first place I google to gain a further insight as I have found both to be sound and well researched. I find all your articles well thought out and biblical, I believe the church in many areas is asleep and I believe your Godly efforts do help wake her up. I have realised that many things I am concerned about in my local area, nationally and globally have a common denominator. Thanks Bill. Keep up the good work! Do many people read the comments? Some do, obviously; there are replies to comments. Maybe that would be a useful temperature gauge- the number of replies to any one posting that draw ‘counter comments’. Same deal for me Bill. There is an abundance of superb Bible study material around. But good quality, up-to-date, cultural commentary, by someone who is personally engaged – is, and always has been, rare. I greatly value your Word-guided ministry in helping keep my attention at the battle-front. I am surprised that you “had not thought about it in those terms”. …. Your page TITLE says it all. Hi Bill, How do you identify your readership as Christian? I have to agree I have good commentaries already but need relevant info on current issues. since the pulpit won’t speak on this we have to find it somewhere. As to the minor issue well a lot of christians, across several denominations, agree on the major issues so not much discussion needed on them ( yes some denominations have problems with the major issues but you probably don’t attract to many of their people here) but the minor issue without a clear ‘thou shalt not’ type of verse they are what has divided the church for centuries and are open to some wiggle room. If you are going to have a passionate argument about something in the faith it has to be about a minor issue. Lets face it human like debating so pick a minor issue pick a side and run with it. As long as you realize it is minor and not a salvation issue debate all you want. Obviously some will make the minor issue major and that in itself cause arguments not only about the right or wrongness of the issue (ok to drink or not) but also is it a salvation issue (drink and you go to hell or not). those are I would say the worthless debates as there is no winner and there is no way to ‘agree to disagree’ because it now contains a salvation aspect. Since salvation is not something to ‘agree to disagree’ on the two sides can never have a congenial end to their debate. Even salvation itself can be a big issue with some because the simplicity of christian salvation is a front to modern man with his complexity and to many who want to earn salvation and feel there has to be SOMETHING that they must do to get salvation. It can be a simple as believing in Christ. They feel there must be some actions that they must take in addition to belief to earn salvation. It always seemed odd to me that there were 2 and 1/3 Billion christian yet Jesus said the path to salvation was narrow and FEW would find it. But as he also said not all who say Lord Lord are truly his. Just as not all the jews in his time were truly of the faith. I wonder how empty most churches would be if only these who are saved (on the narrow path and going through the straight gate) were in the pews??? I have a feeling a whole lot of churches (including MANY MEGA churches) would be empty without even a pastor in them! how many ICHABOD palaces are out there?? ?